Jeans seem to be a staple in most individuals' wardrobes but sooner or later all of those many pair of jeans (even our vary favorite) will wear out and what to do with all those jeans? 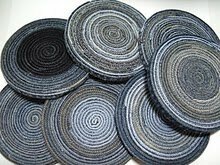 Well, one fantastic idea is to make some cute denim coasters. MyRecycledBags.com shows you how to make some fun denim coasters by upcycling some old jeans, click here to learn how!